Water flows from a fountain at the Boys and Girls Club in Concord, N.H. The federal government said Friday it plans to lower the recommended limit for fluoride in water supplies  the first such change in nearly 50 years. 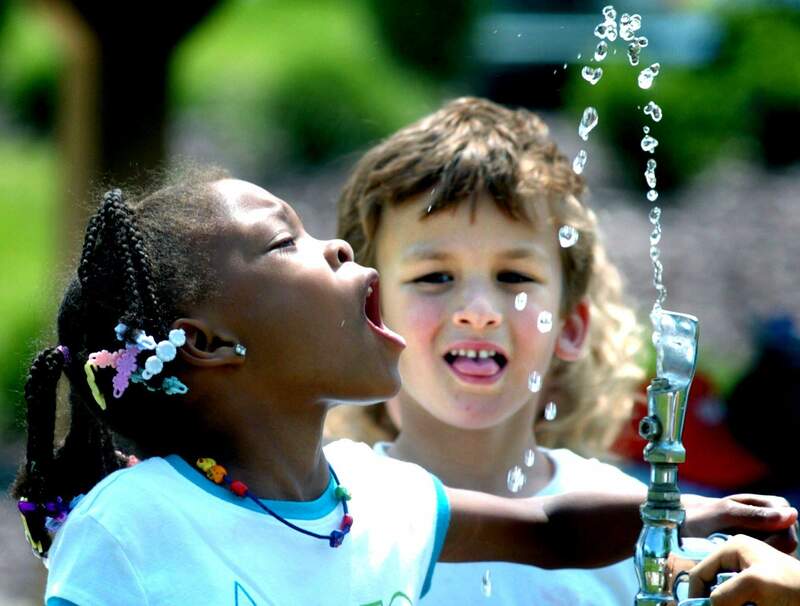 Pennsylvania elementary school students attempt to drink from the water fountain at Montour Preserve, near Washingtonville, Pa., during an outdoor field trip. Fluoride in drinking water, credited with dramatically cutting cavities and tooth decay, may now be too much of a good thing, according to the federal government. 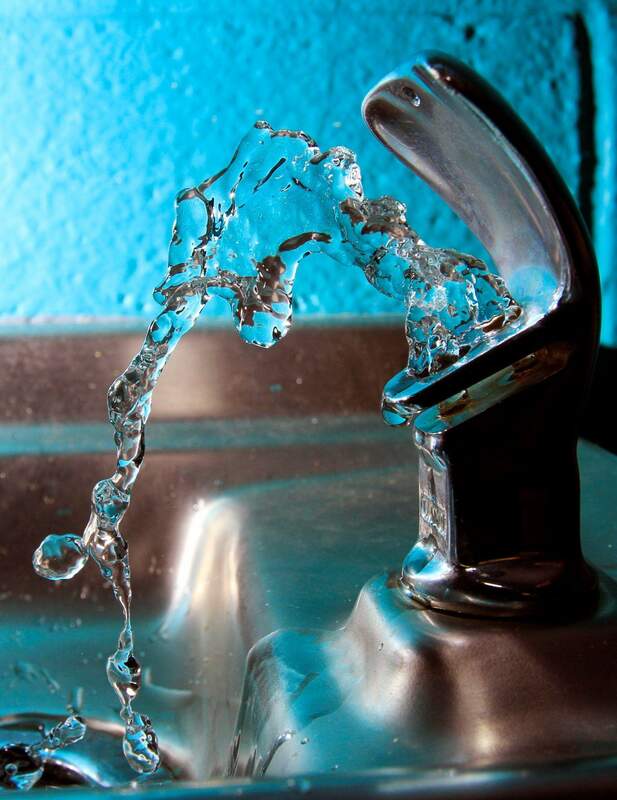 ATLANTA  Fluoride in drinking water  credited with dramatically cutting cavities and tooth decay  may now be too much of a good thing. Getting too much of it causes spots on some kids teeth. A reported increase in the spotting problem is one reason the federal government said last week it plans to lower the recommended levels for fluoride in water supplies  the first such change in nearly 50 years. About 2 out of 5 adolescents have tooth streaking or spottiness because of too much fluoride, a surprising government study found recently. In some extreme cases, teeth can even be pitted by the mineral  though many cases are so mild only dentists notice it. The problem is generally considered cosmetic. The U.S. Department of Health and Human Services is proposing changing the recommended fluoride level to 0.7 milligrams per liter of water. And the Environmental Protection Agency will review whether the maximum cutoff of 4 milligrams per liter is too high. One of the things that were most concerned about is exactly that, said an administration official who was not authorized to speak publicly before the release of the report. The official described the governments plans in an interview with The Associated Press. But there are other concerns, too. A scientific report five years ago said that people who consume a lifetime of too much fluoride  an amount over EPAs limit of 4 milligrams  can incur crippling bone abnormalities and brittleness. Portland, Ore., is one of the largest cities that doesnt fluoridate its water. Its amazing that people have been so convinced that this is an OK thing to do, said Deborah Catrow. She successfully fought a ballot proposal in 2005 that would have added fluoride to drinking water in Springfield, Ohio. Catrow said it was hard standing up to City Hall, the American Dental Association and the state health department. Anybody who was anti-fluoride was considered crazy at the time, she said. In New York, the village of Cobleskill in Schoharie County  west of Albany  stopped adding fluoride to its drinking water in 2007 after the longtime water superintendent became convinced the additive was contributing to his knee problems. Two years later, the village reversed the move after dentists and doctors complained. In March 2006, the National Academy of Sciences released a report recommending that the EPA lower its maximum standard for fluoride in drinking water to below 4 milligrams. The report warned severe fluorosis could occur at 2 milligrams. Also, a majority of the reports authors said a lifetime of drinking water with fluoride at 4 milligrams or higher could raise the risk of broken bones. Late last year, lawyers for the Fluoride Action Network, Beyond Pesticides and Environmental Working Group threatened legal action if the EPA did not lower its ceiling on fluoride. In Europe, fluoride rarely is added to water supplies. In Britain, only about 10 percent of the population has fluoridated water. Its been a controversial issue there, with critics arguing people shouldnt be forced to have medical treatment forced on them. In recent years, the UK has tried to add fluoride to communities with the worst dental health, but theres still considerable opposition. Fluorosis generally has been seen as the primary downside of fluoride. Were not necessarily surprised to see this slow rise in mild fluorosis, Dr. William Kohn, director of the CDCs division of oral health, said in a recent interview. Health officials have hesitated to call it a problem, however. In most kids, its barely noticeable; even dentists have trouble seeing it and sometimes dont bother to tell their unknowing patients. One of water fluoridations biggest advantages is that it benefits all residents of a community  at home, work, school or play. And fluoridations effectiveness in preventing tooth decay is not limited to children but extends throughout life, resulting in improved oral health, said HHS Assistant Secretary for Health Dr. Howard Koh in a statement. Indeed, many health leaders continue to be worried about cavities, particularly among poor families with kids who eat a lot of sweets but dont get much dental care. Associated Press writers Maria Cheng in London, John Seewer in Toledo, David B. Caruso in New York and Dina Cappiello in Washington, D.C., and Nigel Duara in Portland, Ore., contributed to this report.